Mackay Hugh Baillie Scott (1865-1945). Typical stylised carving lower section doors. Elongated strapwork hinges to doors that terminate in a "kiss". Punch effect design sturdy drop loop handles on pierced shaped back plate with what appears to be the original red fabric behind. Exposed tenon construction to flush panel sides. From his early Isle of Man period work/designs; c1898. Approx 62" wide, 66" high, 21.25" depth. The Studio Vol 10 No. 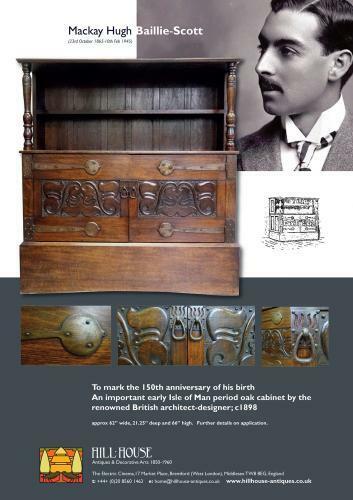 49 April 1897; article by MH Baillie Scott " On the Choice of Simple Furniture". There is a pencil sketch illustration of an almost identical cabinet but with panelled sides and on short legs; a variant, possibly not excecuted.